"The Duchess of Marlborough's Recent Reception"
The Duchess of Marlborough's  recent reception at the Grafton Galleries  proved a fashionable affair. The pretty rooms were at their best and full of flowers, as well as of pretty and smart people. The Duchess wore primrose satin in honor of the day , and a knot of pink malmaisons; on her head was a crown of diamonds, and a zone of the same stones clasped her waist, while strings of pearls fell around her neck, beneath a deep collar of pearls. Near her was Lady Blandford , not in her usual gray, but in heliotrope velvet worn over pink and softened with an edge of chinchilla, and Lady Norah Churchill  was in white satin, with lilies of the valley. The Duke  and Duchess of Rutland  came together, he wearing his Garter and the Duchess in black, with the well-known Rutland tiara . The Duke of Abercorn , also wearing the star and ribbon of the Garter, brought his daughter-in-law, Lady Hamilton , who wore black, with pink flowers, and diamonds and turquoises. Lady Ancaster  was in black, and brought a daughter; Lady Blythswood  wore black with a diamond tiara, and a huge diamond-edged comb; Lady Westbury  was in gray, brightened with rose-color, and Lady Poltimore  was among the many others present, two of the most noticeable guests being Lady Randolph Churchill , in black, with a spray of pink flowers and black osprey in her hair, and Lady Dudley , who looked sweetly pretty in pink, with a bunch of sweet peas and a diamond chain. Florence Bampfylde, Lady Poltimore wears the Poltimore Tiara during the 1911 coronation festivities; read more about the tiara over here! 1. Consuelo Spencer-Churchill, Duchess of Marlborough (1877-1964), born Consuelo Vanderbilt and later Consuelo Balsan, was the American-born first wife of the 9th Duke of Marlborough. She was perhaps the most famous of the "buccaneers," a group of wealthy American heiresses who married British aristocrats during the Gilded Age. In May 1898, Consuelo was 21; she'd been married to the Duke for about two and a half years, and she was about four months pregnant with their second son, Lord Ivor Spencer-Churchill. 2. The Grafton Galleries, located on Bond Street, was an art gallery space in Mayfair that existed from around the 1870s until the 1930s. In May 1898, when the Duchess held her reception there, the gallery housed an exhibition of Australian art. 3. Consuelo wore pale yellow "primrose satin" for this reception (which took place on May 3, 1898) because it was held for delegates of the Primrose League, an organization dedicated to supporting Tory causes in Britain. The League was founded in honor of the late prime minister Benjamin Disraeli and named after his favorite flower, the primrose. In 1898, Consuelo's husband, the 9th Duke, was Chancellor of the League. The Duke also attended the reception, and the League's publication, the Primrose League Gazette, noted in the June 1898 issue that the "Duke and Duchess stood for an hour and a half at the entrance to the largest gallery, receiving with never-failing amiability and courtesy the ever-flowing stream of guests." 4. 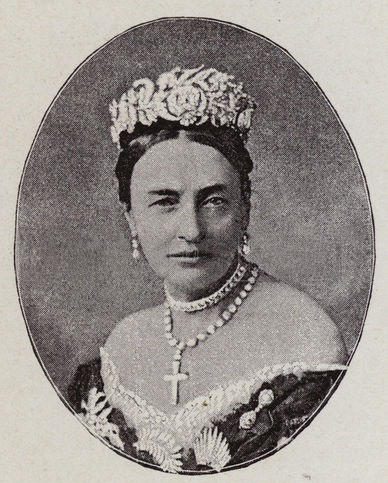 Albertha, Duchess of Marlborough (1847-1932), born Lady Albertha Hamilton, was the mother of the 9th Duke of Marlborough (and, therefore, Conseulo's mother-in-law). Albertha was a daughter of the 1st Duke of Abercorn and the first wife of the 8th Duke of Marlborough, but they divorced in 1883, less than a year after he inherited the dukedom. Albertha successfully petitioned for the divorce on the grounds that her husband had deserted her, committed adultery with Lady Aylesford, and committed domestic violence on one occasion in June 1875. She won custody of their children. Rather than use the customary form of address that she should have employed after their divorce -- Albertha, Duchess of Marlborough -- she preferred to be known by a version of the title that she held during the majority of their marriage: Albertha, Marchioness of Blandford. Everyone in Victorian society appears to have gone along with it. Albertha was 50 at the time of this reception, with two adult daughters, Lady Lillian and Lady Norah, still living at home. 5. Lady Norah Spencer-Churchill (1875-1946) was the youngest daughter of the 8th Duke of Marlborough. She was 22 at the time of this reception, and she was often described as Consuelo's favorite sister-in-law. Norah remained unmarried for decades, suffering from precarious health and serving as a companion to her often-ailing mother. In 1905, she was engaged to the Hon. George Harry William Walsh (later the 4th Baron Ormathwaite), but disagreements about her financial settlement ended the match. In December 1920, when she was 45, Norah finally wed, marrying the writer and diplomat Francis Bradley-Birt. 6. John Manners, 7th Duke of Rutland (1818-1906) was a committed Tory politician and statesman and a published poet. He knew Disraeli personally, working closely with him during the Young England movement in the 1840s, and the Duke and Duchess were active members in the Primrose League. The Duke's proudly-sported Garter insignia was still fairly fresh; he was made a Knight of the Order of the Garter by Queen Victoria in 1891. 7. Janetta Manners, Duchess of Rutland (1837-1899), born Janetta Hughan, was a writer and aristocrat. She was a granddaughter of the 8th Duke of St. Albans and the second wife of the 7th Duke of Rutland. Janetta was just as devoted to Tory causes as her husband; her published books included an 1881 memoir about Disraeli. Janetta may have worn black to this reception because she was still in mourning for her youngest son, Lord William Manners, who had died suddenly at the age of 24 in March 1897. About a year after this reception, further sadness consumed the family. Janetta and her family traveled to Germany, hoping to find relief for the heart condition that plagued her, but she died in Hamburg that July. 8. 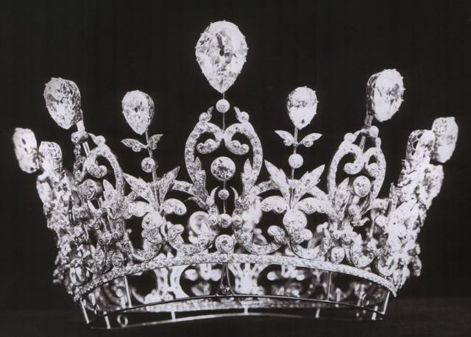 The Rutland Tiara is an antique diamond-set piece with a floral theme. Diana Scarisbrick describes it as "botanical," noting that the blossoms depicted in the piece are fuschias. 9. James Hamilton, 2nd Duke of Abercorn (1838-1913) was a Tory politician and diplomat. He was the eldest brother of Lady Blandford, and therefore also an uncle of the 9th Duke of Marlborough. (He was also a great-great-grandfather of the late Diana, Princess of Wales.) He was an active member and leader within the Primrose League. Queen Victoria made him a Knight of the Order of the Garter in 1892. 10. Rosalind Hamilton, Marchioness of Hamilton (1869-1958), born Lady Rosalind Bingham and later Duchess of Abercorn. She was a daughter of the 4th Earl of Lucan and a granddaughter of the 5th Duke of Richmond. She married the future 3rd Duke of Abercorn in 1894. Through her daughter, Cynthia, she was a great-grandmother of the late Diana, Princess of Wales. She also held leadership positions within the Primrose League. 11. Evelyn Heathcote-Drummond-Willoughby, Countess of Ancaster (1846-1921), born Lady Evelyn Gordon, was a daughter of the 10th Marquess of Huntly and the wife of the 1st Earl of Ancaster. Lady Ancaster and her husband were both active members of the Primrose League. She had six daughters: Lady Evelyn, Lady Margaret, Lady Nina, Lady Cecilie, Lady Alice, and Lady Mary. 12. Augusta Campbell, Lady Blythswood (1841-1922), born the Hon. Augusta Carrington, was the wife of the 1st Baron Blythswood. Both Augusta and her husband were active Primrose League members; in fact, in 1897, she was appointed Dame President of Scotland of the League. Augusta and her husband were also enthusiastic amateur scientists. 13. Mary Florence Bethell, Lady Westbury (d. 1901), born Mary Florence Luttrell, was the wife of the 2nd Baron Westbury. After her husband's death, she forged a public life for herself, and serving in various capacities in the Primrose League was a major part of that effort. 14. Florence Bampfylde, Lady Poltimore (d. 1909), born Florence Brinsley Sheridan, was the wife of the 2nd Baron Poltimore. Florence's husband had been a Whig politician, but later in life, he shifted politically and joined the Tories. Afterward, both he and Florence became active members of the Primrose League. 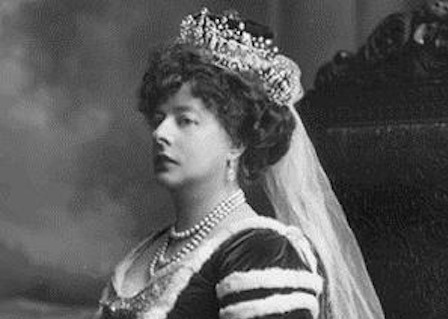 Florence was also the original owner of the Poltimore Tiara, which later became famous as Princess Margaret's wedding tiara. 15. Lady Randolph Churchill (1854-1921), born Jennie Jerome, was the American-born mother of Winston Churchill. Her first husband, Lord Randolph Churchill, was one of the founders of the Primrose League. 16. Rachel Ward, Lady Dudley (1868-1920), born Rachel Gurney, was the first wife of the 2nd Earl of Dudley. Lord Dudley was a Tory politician, and the two were active Primrose League members.